Rawhide cord makes an ideal companion for the style of this polymer clay necklace. The brown cord slips through the focal bead, decorative floral silver beads and the two smooth clay tube beads. Combined, the elements add plenty of color and texture for this interesting necklace. The focal bead texture is created with a rubber stamp. Any floral rubber stamp will work. Be sure to remove it from its wood block so it will be flexible enough to peel off after making an impression. Clay artist, Syndee Holt taught me to step on the stamp to get the maximum depth in the clay. It works every time! The technique works especially well for projects like this where you want to apply ink to the base design and then remove only the ink on the very surface. "Mushroom" alcohol ink was used here - it's one of my new favorites. This necklace doesn't require super human talent. The rubber stamp does most of the work but you can take all the credit! step 1 - Mix a bit of red clay with the orange to achieve the color pictured. Roll the clay on the #2 setting of the conditioning machine. Cut it to measure 2" x 4". step 2 - Dust your rubber stamp or texture sheet with baby powder. Remove the excess. 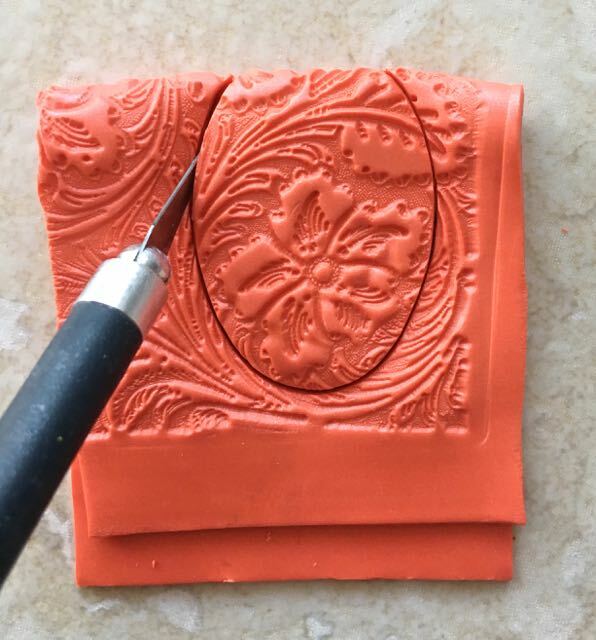 step 3 - Place the clay on a ceramic tile with the stamp face down on top. Place another tile oven it. Set everything on the floor and step on it several times to get the maximum impression. step 4 - Remove the clay from the tile. Place a ½” piece of card stock on the center of the plain side of the clay and fold it over with the texture on the outside. step 5 - Position the oval cutter slightly higher than the fold of the clay. step 6 - Press the cutter to cut the clay. step 7 - Remove the card stock and finishing cutting through both layers with a craft knife. step 8 - Slip a wooden skewer into the top of the clay opening. step 9 - Blend and seal the two layers below the skewer with a sculpting tool. step 10 - With a brush, color the clay with ink. step 11 - Gently remove the surface ink with a Q-tip dipped in rubbing alcohol. Blot the excess on a paper towel. Do not push down on the clay, only skim the surface. step 12 - If your design has a flower, press a 4mm round, silver bead into the center. step 13 - Remove the skewer from the clay. Cut two .50” square pieces of clay. Wrap them around the skewer to form tube beads. Blend the ends together. Twist the beads to be sure they move on the skewer. step 14 - Return the skewer to the focal clay bead. Place the skewer and beads on a ceramic tile covered with parchment paper and bake at 275 degrees for 30 minutes. Allow the clay to cool. step 15 - Cut the rawhide twice as long as need for your neck size. Fold in half and thread the fold into a clay bead and a silver bead. step 16 - Thread the fold trough the focal bead. step 17 - Use a toothpick to apply the adhesive to the inside of the end cap. Cut the fold of the rawhide and apply adhesive to the ends. step 18 - Insert the ends into the end cap. step 19 - Wrap a piece of rawhide around the two strips and use adhesive to glue them together on the backside of the necklace. step 20 - Use pliers to open the jump rings. Attach a lobster clasp and ring to the end caps. step 21 - (optional) Buff the focal bead with a soft cloth or buffing machine.